“The Final Girls”is a very funny and entertaining movie that produced a lot of laughs, and was quite well-received by the /slash-crowd which still stuck around at 1.00 a.m. Like “Cooties”, it’s definitely one of those horror comedies that put way more emphasis on the comedy- than the horror part, so if you like movies like that a little bit darker and/or scarier, you might not be quite as pleased with it as I was. It’s definitely rather harmless and light, but it was exactly what I needed after “Baskin” almost put me to sleep. When I watched “The Final Girls”, I actually hadn’t seen the original “Friday the 13th” yet, only “Freddy vs. Jason” and the 2009-remake. An oversight that has been remedied since then, but which didn’t diminish my enjoyment of this parody. However, knowing nothing about the movie other than the title and the cast, I have to say that the overall concept (with them pretty much getting sucked into her mom’s movie) briefly threw me off, since it caught me completely unaware, and it admittedly took me a while to get used to it. Once I accepted it, though, I mostly had a blast with the movie. It’s a great parody of the slasher movies of the 80s in general and the “Friday the 13th”-films in particular, and they also have a lot of fun with typical stylistic movie devices like overlays, flashbacks and slow motion (even though the placing of said sequence, which was incredibly funny, directly after the death of a character was a little unfortunate). There’s also a hint of “Scream” here, with the characters not just being aware of the typical slasher-rules in general, but actually knowing the plot of the movie that they’re stuck in. I also liked the sometimes consciously artificial look of the movie (like the flowers and the oversaturated colors) and the equally conscious clichéd characters that occupy this summer camp. Despite all the humor, though, “The Final Girls” also has a serious streak that deals with loss and having to let go of a beloved person, which I also quite liked. Thus, I really enjoyed the scenes between Max and Nancy. And kudos to the movie for not taking a turn that I feared it would take for a while. The whole showdown was very strong and at parts also emotional. And even though I called the ending about halfway in, and didn’t like the fact that certain previous developments were nullified, the overall idea was quite clever (and also logical, in a way). The cast is good, with Taissa Farmiga (who already garnered some horror-experience with “American Horror Story”) THE major standout. She’s definitely a very talented young woman worth looking out for. Nina Dobrev and Alia Shawkat were also great, and even though I’m not the biggest fan of Malin Akerman, she gave a decent performance here. My only major complaint was the depiction of the horror geek as extremely bloodthirsty. 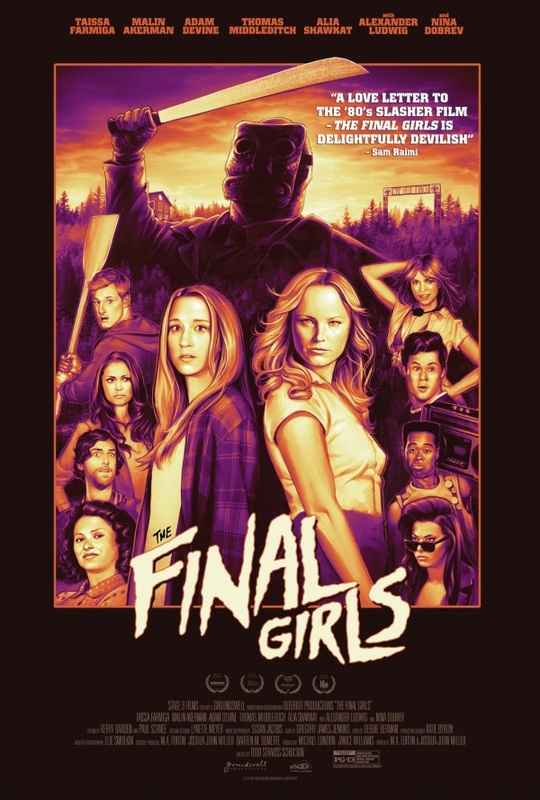 Granted, there definitely are people like that, but given the fact that “The Final Girls” mostly caters to fans of the genre, and he was pretty much the only horror geek featured here, I found his depiction worrisome and slightly insulting. Couldn’t they’ve at least included a second horror fan who wasn’t quite as hot for violence? I guess that, just like the rest of the movie, it was meant to be tongue-in-cheek, but I have to admit that it slightly rubbed me the wrong way. Apart from that, though, I had a lot of fun with it. This entry was posted in /slash, movie reviews, new releases and tagged /slash, /slash 2015, comedy, horror, Malin Akerman, Nina Dobrev, Taissa Farmiga, The Final Girls, Todd Strauss-Schulson, USA. Bookmark the permalink.